My first place goes to one of three beers from Williams Bros in the lineup; looking through my notes, it’s interesting to see that the brewery has managed to spread its beers right across my rankings! 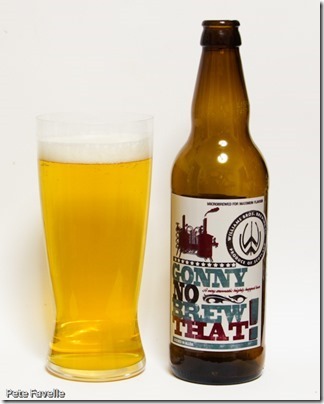 Gonny No Brew That has to be one of the stranger beer names, but fortunately all that counts to my score is the drink. I confess that the blurb on beer labels often leaves me jaded by an overload of hyperbole, so while the claim of “hops, hops and more hops” is exciting, that thrill is tempered with a fear – almost an expectation – of disappointment. Bright and pale straw gold in the glass, the nose certainly dispels that fear – there are hops by the bucketload here, floral, fresh green fruit that has my mouth watering. The flavours are bang on too; a sweet slightly foamy start with soft green fruit from the hops which slowly build up towards a deep, resinous finish that manages to retain some of the sweetness. Yes, it’s heavily hopped but it manages to hit that perfect balance of being full of hops without becoming nothing but hops. The sweetness is big enough to hold the hoppiness in check right to the end, and yet somehow the beer stays light and refreshing. This is precisely the beer that I think should win a national spot; it stands proudly out from the crowd but it’s not unapproachable by the masses outside the beerosphere who would run a mile from a true hop monster. Gonny No Brew That? Gonny Drink That. Many thanks to Sainsbury’s for providing samples of the GBBH beers. I suspect the name is borrowed from a series of sketches on Chewin’ The Fat, a Scottish comedy show from a few years ago. Gonny No Brew That was one of my top 3, with Harbour Porter No. 6 and Harbour IPA. Still surprised only one of those made the top 12!